Emma Stebbins (1 September 1815 – 25 October 1882) was an American sculptor. She is best known for her work “The Angel of the Waters” (1873), also known as “Bethesda Fountain,” located on the Bethesda Terrace in Central Park, New York. Stebbins was born in New York City to a wealthy family who encouraged by her pursuit of art from an early age. In 1857, her brother Col. Henry G. Stebbins (head of the New York Stock Exchange) sponsored her to move to Rome, where she moved in with sculptor Harriet Hosmer, who had established herself there in 1852. She studied under John Gibson, an English neoclassicist working there at that time. In Rome, she was able to become involved in the bohemian and feminist lesbian lifestyle, which was far less acceptable in New York. Stebbins fell in love with actress Charlotte Cushman. Cushman was confident, strong, and charismatic, and recently recovering from a break up following a ten-year relationship with the actress Matilda Hays. Cushman and Stebbins began traveling together, immediately taking a trip to Naples. 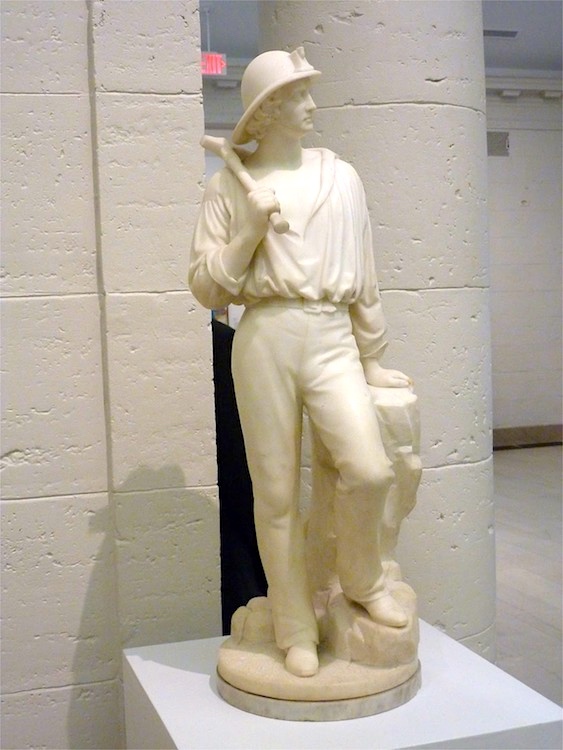 Upon their return, they began spending time in a circle that included African American/Native American sculptor Edmonia Lewis and other lesbians, such as Harriet Hosmer. In 1869, Cushman was treated for breast cancer. Stebbins devoted all her time to nursing Cushman, ignoring her work during the next two years. The following year, the couple returned to the United States. Cushman died of pneumonia in 1876 at the age of 59. Following the death of Cushman, Stebbins never produced another sculpture. She spent her final years producing the correspondence, Charlotte Cushman: Her Letters and Memories of Her Life in 1878. Stebbins died in New York in 1882, at the age of 67. Most of what is known of Stebbins is due to the efforts of her older sister Mary Stebbins Garland, who documented her sister’s life posthumously in a biography and a scrapbook. The unpublished biography is entitled “Notes on the Art Life of Emma Stebbins” (1888). In the scrapbook, Garland arranged images of Stebbins’ works created between 1857 and 1870 in chronological order, noting the titles and dates of execution of each work. She included photographs of Stebbins and of people who had encouraged her career (such as her teacher Paul Akers, Henry Stebbins, and Charlotte Cushman), newspaper clippings and handwritten biographical notes. Emma Stebbins, her brother Henry and other family members are buried at Green-Wood Cemetery, in Brooklyn, New York. On June 14, 2014, Stebbins was featured in the first gay-themed tour of Green-Wood Cemetery. A statue of Horace Mann, the first president of Antioch College, has been the topic of much discussion lately [the piece is, annoyingly, undated] on the campus over which he once presided. Erected on a site in Glen Helen that was once part of Mann’s farm by Hugh Taylor Birch, class of 1869, as part of a national celebration marking the centennial of public education in America, the statue is the second of two cast from the same mold, albeit about 75 years apart, and one of the few bronze works of its sculptor, Emma Stebbins, who normally worked in marble. A movement to construct a statue to honor Mann’s accomplishments began shortly after his death in 1859. 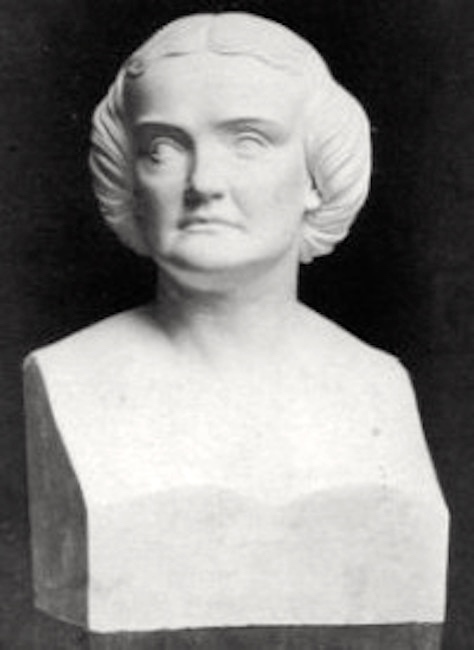 One impetus that gave momentum to this effort, led by Mann’s widow Mary and her sister Elizabeth Peabody, was a statue erected that year outside the Massachusetts statehouse to honor another favorite son: Senator Daniel Webster, whom Mann once admired but the two had become bitter rivals over Webster’s support of the Fugitive Slave Act of 1850. 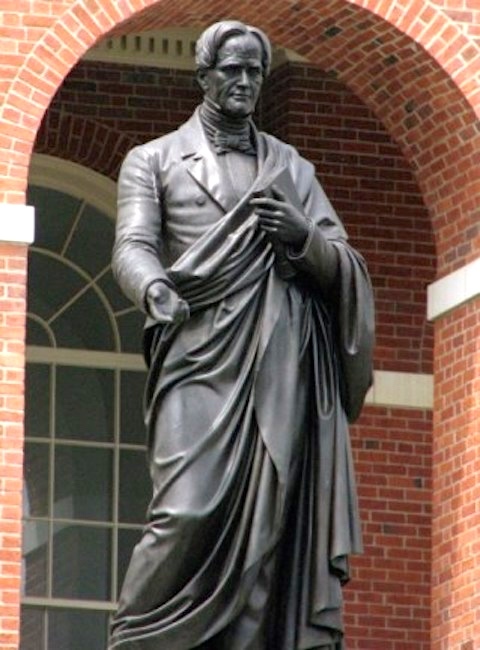 Many a Mann supporter agreed that Webster had sold his Whig principles to slavery, and therefore sought to have a statue to honor a representative of their state who did not compromise the fundamental belief in equality merely to sustain the unsustainable relationship between the States. Mann’s friends and family began to raise money almost immediately and proceeded to find a reputable sculptor, which they found in Emma Stebbins. Horace Mann (May 4, 1796 – August 2, 1859) was an American educational reformer and Whig politician dedicated to promoting public education. He served in the Massachusetts State legislature (1827–1837). In 1848, after public service as Secretary of the Massachusetts State Board of Education, Mann was elected to the United States House of Representatives (1848–1853). … Arguing that universal public education was the best way to turn unruly American children into disciplined, judicious republican citizens, Mann won widespread approval from modernizers, especially in the Whig Party, for building public schools. Most states adopted a version of the system Mann established in Massachusetts, especially the program for normal schools to train professional teachers. Nathaniel Hawthorne (born Nathaniel Hathorne; July 4, 1804 [in Salem MA] – May 19, 1864) was an American novelist, dark romantic, and short story writer. [In 1870] Emma’s family began to openly question Emma’s relationship with Cushman, saying that her life with Cushman had injured her “morally, socially, and physically.” Similar comments were made about Stebbins by members of Cushman’s family. Yet the women withstood these attacks, refusing to be separated. With no outstanding commissions, Stebbins could give up sculpture without going back on her word to any client, and spend her time caring for her partner. Meanwhile, Cushman, knowing she had only a few years to live, was working to consolidate her fortune for the benefit of her heirs: her nephew and adopted son, Edward Merriman Cushman and Emma Stebbins. During 1871, Cushman re-established herself in Newport, Rhode Island, where she was joined by her nephew and his family. Soon thereafter she began a series of farewell performance tours. … From 1878 to 1882 Emma Stebbins wandered between winter visits at her sisters’ houses in New York and summer stays in Lenox, Massachusetts, vainly seeking relief from the pulmonary condition … related … to her years of carving marble and inhaling its dust. 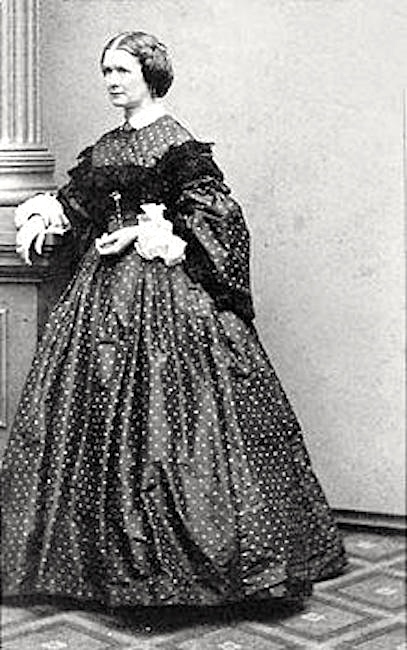 Charlotte Saunders Cushman (July 23, 1816 – February 18, 1876) was an American stage actress. Her voice was noted for its full contralto register, and she was able to play both male and female parts. She lived intermittently in Rome, in an expatriate colony of prominent artists and sculptors, some of whom became part of her tempestuous private life. This entry was posted on August 31, 2017 at 5:44 am and is filed under Art, Gender and sexuality. You can follow any responses to this entry through the RSS 2.0 feed. You can leave a response, or trackback from your own site.